Compatible Canon Ink Cartridge, Black, 650 page yield. 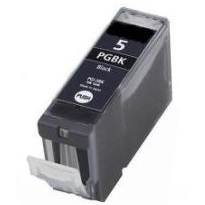 Replaces Canon part number: PGI-5BK, 0628B002. Love these products... they work fantastic. Best ink for printer value I have ever found. I don't know how long this ink will last, that's why I can only give it 4 stars. However so far I am very pleased with it. It fits the printer and prints with excellent quality. Also it was a very good price. Great service, ink works wonderfully, fast shipping. Very good quality and excellent price. Fast shipping. This is the second time I bought these products. I was pleased last time with the quality of the ink. If I am happy again, I will definitely be a repeat customer! I have been using this product for about 5 years, and can detect no difference in quality or performance from the brand name product, except I save about 75%. Works for me! Vibrant color and bold black. Compatible Canon Ink Cartridge, Cyan, 280 page yield. Replaces Canon part number: CLI-8C, 0621B002. Compatible Canon Ink Cartridge, Magenta, 280 page yield. Replaces Canon part number: CLI-8M, 0622B002. Compatible Canon Ink Cartridge, Yellow, 280 page yield. Replaces Canon part number: CLI-8Y, 0623B002. Compatible Canon Ink Cartridge, Black, 280 page yield. Replaces Canon part number: CLI-8BK, 0620B002. Compatible Canon Ink Cartridge, Photo Cyan, 450 page yield. Replaces Canon part number: CLI-8PC, 0624B002. Compatible Canon Ink Cartridge, Photo Magenta, 450 page yield. Replaces Canon part number: CLI-8PM, 0625B002.